The Children of God's Body is a tale set right after the death of Akhenaten. Smenkhare is on the throne at the beginning of our tale, but not for long. Prince Tutankhaten (soon to be Tutankhamen) is only nine years old. Kemet is in a perilous state with enemies preying on her borders due to the political unrest occasioned during the mystic reign of Akhenaten. Much of the Court still upholds the change to the religion of the Aten, but the cracks are showing. Smenkhare has already reopened the Temples of Amen in Waset and the priesthood, in hiding for so many years, is rising in power once again. Our tale is about the battle for the hearts and minds of the ruling class as they struggle between the new and old ways. Which will win? It's politics, intrigue, scandal, and at the same time a highly mystical period in Kemet's history. 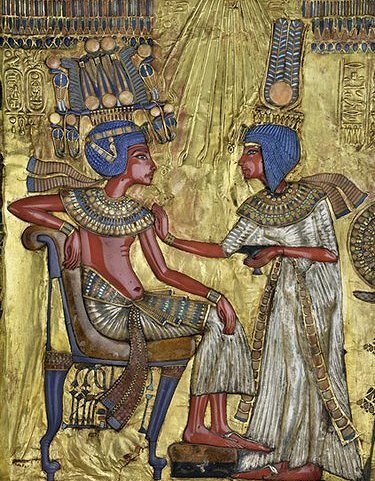 At the center of the whole struggle for the heart and soul of a nation is young Tutankhamen, Boy King, raised in the Court of Akhenaten to believe fervently in the Solar Disk, Aten, now asked to change his loyalties and beliefs. This novel welcomes both points of view, though we will be following history as far as the results of this struggle are concerned. There is, however, plenty of literary freedom as this period is murky in the records at best. We will take poetic license when it comes to those gaps in scholarly knowledge to present our human version of events - the very real struggle that took place between two factions. While we know that Amen eventually gains ascendance in Kemet once again we are full sympathy with our Atenist brethren (even if some of us view them as heretics). Admittance to this novel is by invitation or application. We might require writing samples or demonstration of your knowledge of Kemetic history and culture. We intend to keep this novel small with a steady pace with emphasis on a story well told as well as beautifully presented so that the end result is as beautiful as the ancient culture it hopes to portray.